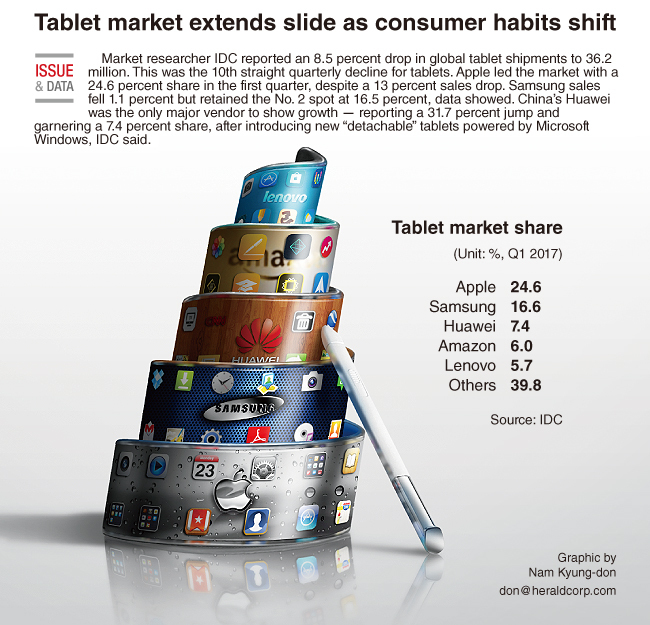 IDC reported an 8.5 percent drop in global tablet shipments to 36.2 million. This was the 10th straight quarterly decline for tablets. Apple led the market with a 24.6 percent share in the first quarter, despite a 13 percent sales drop. Samsung sales fell 1.1 percent but retained the number two spot at 16.5 percent, data showed. China’s Huawei was the only major vendor to show growth -- reporting a 31.7 percent jump, garnering a 7.4 percent share, after introducing new “detachable” tablets powered by Microsoft Windows, IDC said. IDC estimated that Amazon, which does not report detailed sales figures, sold 2.2 million tablets for a 6 percent market share, Lenovo held the No. 5 spot with a market share of 5.7 percent, according to IDC.